In March, I got a distro order from someone who lives in the city. Instead of giving me their mailing address, they told me where they worked and asked if I could drop off some zines. Of course! I put ’em in my backpack, rode my bike up to the Plateau, and hand-delivered ’em. I was on my way to a pro-choice demo in the area anyway. I’m pretty sure that delivering zines by bicycle is totally adorable and fun, and I wanna do it more often! Ever since the article about my distro was printed in the Montreal Gazette, I’ve been getting a lot more orders from people within the city, including people who had never even heard of zines before! So, if anyone in Montreal wants to place an order and avoid postage costs, you can always send me an email with your address and we can work out a plan. I live in St-Henri, but I bike all over the city all the time. Let’s talk! 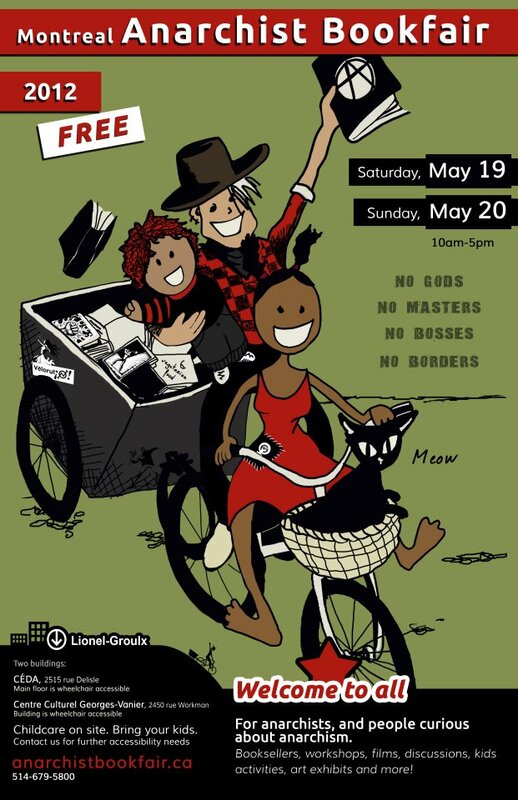 That said, I’ll be tabling at the Montreal Anarchist Bookfair all weekend. Please stop by! The bookfair is taking place in two buildings right across from each other – the Centre d’éducation populaire de la Petite-Bourgogne et de St-Henri (CEDA) at 2515 rue Delisle, and the Centre Culturel Georges-Vanier (CCGV) at 2450 rue Workman. Fight Boredom Distro will be at CEDA, but please make your way through the whole shebang. I hear there’s gonna be free coffee! And the Midnight Kitchen is providing food (there’s still time to volunteer to help cook, by the way). Mostly, my life has been taken over by a few specific projects. One of them is preparing for the anarchist bookfair – ordering zines, screenprinting patches and posters (and helping friends with their screenprinting projects at the Ste-Émilie Skillshare), and working on some new zines. Still gotta do some cutting and pasting and photocopying and folding and stapling and and and… Speaking of, if you’d like to volunteer at the Ste-Émilie Skillshare, now is your chance! There are info and training sessions for the Sidetracks Team taking place on May 26th and 27th. I highly recommend joining! I’ve been on the Sidetracks Team since maybe two years ago, which means helping print t-shirts and posters and whatnot for various community groups, as well as having access to the space for personal projects. It’s a seriously amazing resource – the more, the merrier! I’M ALSO WORKING ON TWO SECRET PROJECTS SSSHHHHHH. If you applied for the Fight Boredom Zine Residency and haven’t heard back from me yet, don’t worry, you will. There were about thirty applications sent in, and out of those, we’ve managed to narrow it down to six people. Of course, we’re only able to choose three. We’re still workin’ on it. I can’t even tell you how difficult it is – there were so many exciting proposals and I wish I could make them all happen. Whether or not you’re chosen for the residency, I’ll still be in touch with thoughts and feedback. Soon! I was riding my bike to the Plateau yesterday evening, and walked uphill on Clark because dammit I’m just not good at riding uphill. 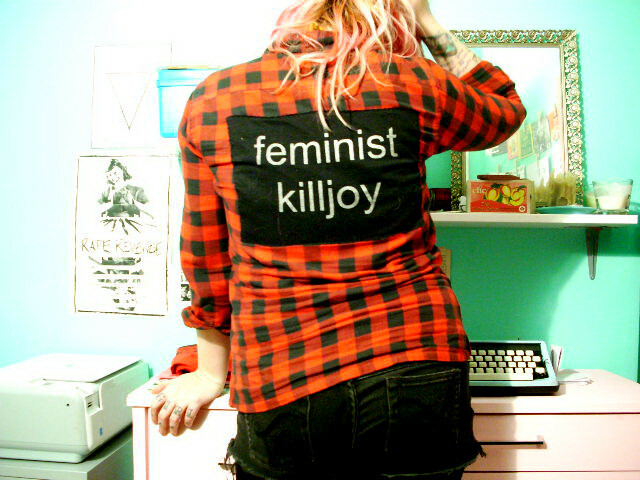 A middle-aged Francophone man stopped me and asked about the feminist killjoy backpatch on my flannel shirt. I told him that I’m a feminist who ruins everyone’s fun. He said he was happy to see young feminists in Québec, he said there weren’t enough of us, he smiled, and he wished me une bonne journée. (Yeah, I don’t update this blog much anymore, but I write about things on my Tumblr sometimes). I can’t even imagine how difficult it would be to pick three candidates for your residency among so many qualified applicants. What a treat, though. Very excited to hear more about the secret projects you have going on! I’m gonna be working on my own projects alongside the zine residency participants and I’m already looking forward to autumn, when I’ll be able to look back at a stack of zines that were created over the summer. Can’t wait to hang with everyone! This is my new catch-phrase.